Note: this webpage describes the fully fledged SODERA variant. Pls. contact us to determine which variant is suitable for you and which features it includes. SODERA's core function is to capture Bluetooth Classic and Bluetooth Low Energy data packets from over-the-air Bluetooth traffic regardless of how many devices create that traffic, what Bluetooth technology, what topology and what protocols are used. The captured data are decrypted, decoded and analyzed by the sophisticated engine to provide the comprehensive views and understanding of the communication how it actually happened in the air. 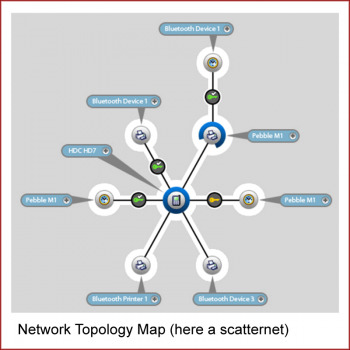 A thorough guide thru major SODERA functions when capturing the Bluetooth data from the Air and subsequently recording, decrypting, decoding and analyzing the captured data. 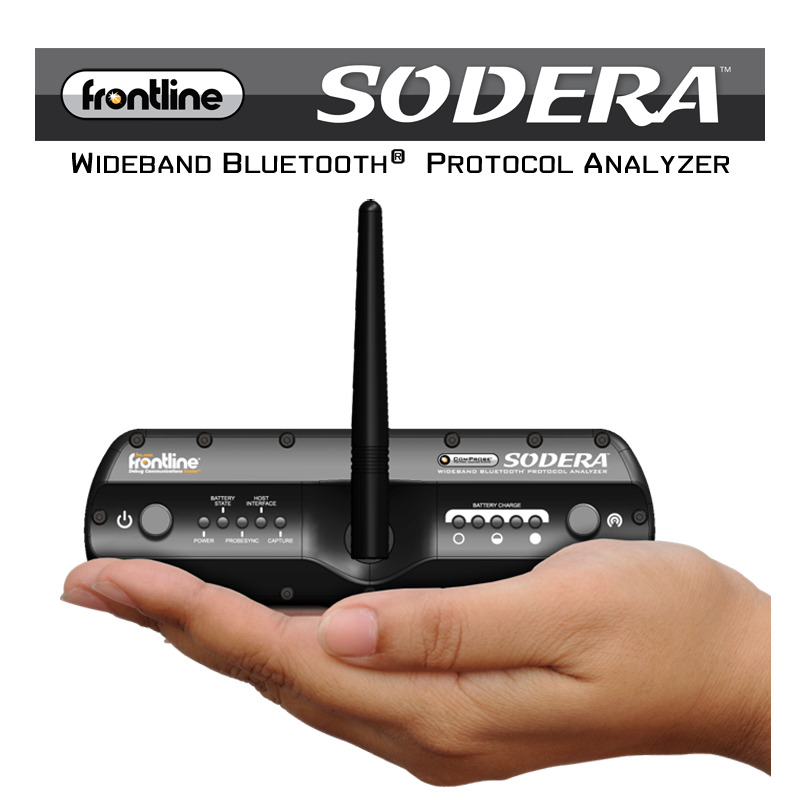 How to capture Bluetooth data with the SODERA box alone. Without any power source, without any measuring PC at all. 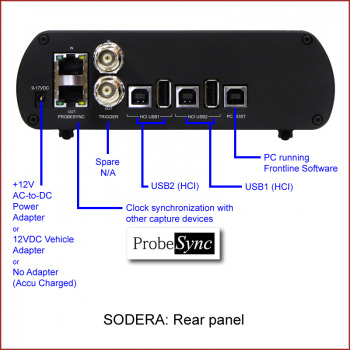 Pre-configure, put the SODERA box in a car, press the button and SODERA captures the data. Simply. Explore how the 2.4 GHz band is shared with other technologies. 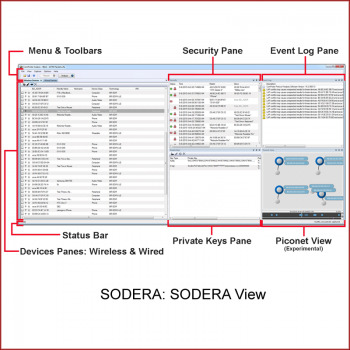 On top of over-the-air Bluetooth data capture SODERA is capable to capture also data from up to two HCI (Host Controller Interface) circuits simultaneously and synchronously. 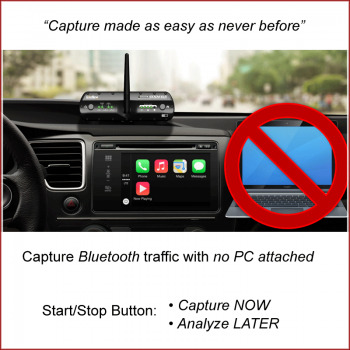 This capability allows to correlate the occurrence of the HCI commands and data in any Bluetooth hardware device unit and those present in the air, including the very exact timing differences. 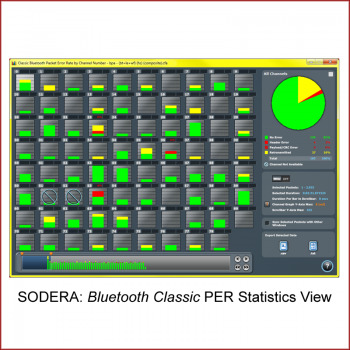 SODERA allows to check whether a Bluetooth Controller performs its function according to the Bluetooth specification. 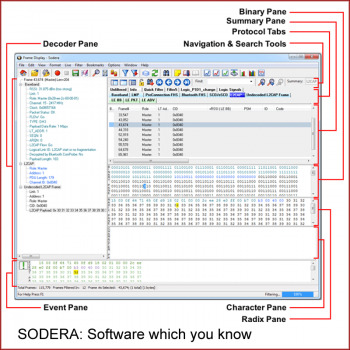 SODERA also helps the developer to understand the correlation between the real HCI and the real air traffic. The HCI interface is the part of the official Bluetooth specification. The HCI and its wires are accessible in many cases of the Bluetooth device's architecture, including many Bluetooth Low Energy devices. Correlate UART (HCI) commands in hardware with the Bluetooth air traffic. Sniff USB (HCI) interface in a very easy way. The USB HCI is common in the case of various external Bluetooth dongles which wirelessly connect some remote Bluetooth accessories. ... continues. You may measure one HCI or two HCIs in addition to the continuous air sniffing. In the case of two HCIs you may measure any possible combination (UART & UART, UART & USB, USB & USB). Alternatively, you may measure one HCI and the second port use for the Logic Analyzer functionality [see the next tab]. 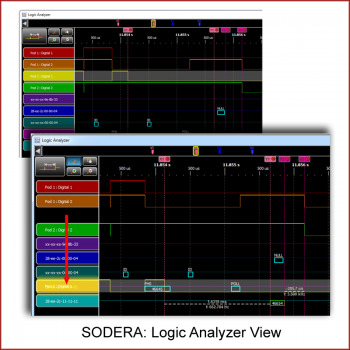 Logic Analyzer comes standard with all SODERA analyzers. The capability allows to make relative time measurements between your hardware logic signals and the Bluetooth traffic packets. Captured logic signals are timestamped and are time synchronized with Bluetooth packets in the Logic Analyzer view. 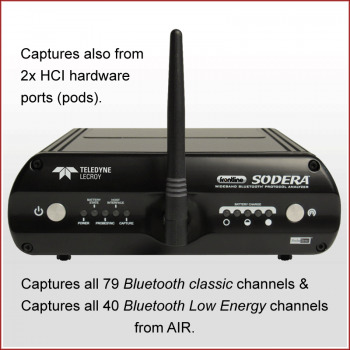 SODERA features 2 PODs, each providing 2 digital wire taps. 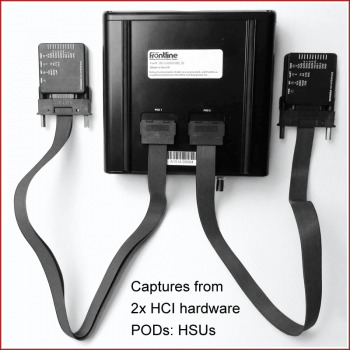 You may use a single POD (2 digital wires) in the combination with one HCI circuit and over-the-air sniffing concurrently, or you may use both PODs (4 digital wires total) with over-the-air concurrent sniffing. Logic Analyzer view is especially useful when your Bluetooth device features the compact design. * Shorten your time to market by using the Logic Analyzer to troubleshoot difficult timing problems. 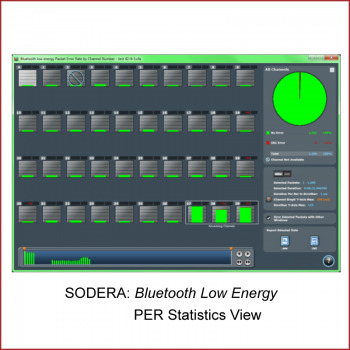 The overall survey of the Logic Analyzer functions in SODERA. Quick guide how to make precise delta time measurements using the SODERA's Logic Analyzer view, including markers and multiple markers. The short overview of the top navigation bar basic functions: the high-level zooming, width of the viewport setting and time shifting of the viewport. 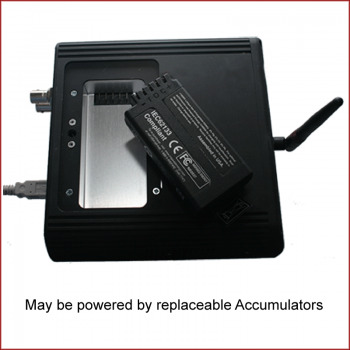 * Compact design of a Bluetooth device means that the functions of the Bluetooth Host and of the Bluetooth Controller are compounded into a single chip. Single purpose devices, such as a specific Bluetooth Low Energy sensor or Bluetooth Classic wearable headset are the typical examples. Consequently, the HCI interface is not accessible. However, even such chips still exhibit their own hardware interface and are a part of a broader hardware environment. It is possible to locate certain hardware wires which control or indicate the behaviour of the chip with regard to the Bluetooth communication in the air. 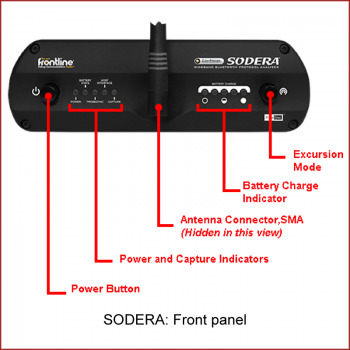 SODERA allows to intercept these signals and to correlate their logical changes in connection with the captured over-the-air Bluetooth traffic. - Bluetooth v4.0 "low energy"